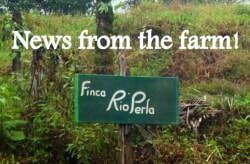 Finca Rio Perla is a 100 hectare (240 acre) farm located along the Rio Perla (Perla River) in the Caribbean Highlands of Costa Rica about half-way between San Jose and Limon. Being on the slopes of Turrialba Volcano, with elevation from about 350 to 750 meters (1,000 to 2,250 feet), we have several amazing waterfalls and natural pools, and we are blessed with moderate temperatures, great breezes, wonderful views, and beautiful birds and flowers. Activities include hiking, swimming, horseback riding, fishing, farm tours, farm activities (yes, get your hands dirty), and just relaxing in nature. We also have pleasant lodging and really good food. ​We offer an authentic Tico experience that everyone can enjoy. Pura Vida! => Easy access by car and bus/taxi (we can help arrange transport). Finca Rio Perla can help you plan the itinerary and logistics for your visit to/from Finca Rio Perla, along with logistics to other areas of the Caribbean and other parts of Costa Rica. contact us for more details. Contact us first for custom package pricing and pay with PayPal with US Dollars. See our Facebook & TripAdvisor links below. Ver nuestra Facebook y TripAdvisor abajo. We are continuing to renovate our macadamia nut trees, and to plant more cocoa and coffee seedlings. We are also setting up the machinery and improving the drying areas for our macadamia nuts, coffee and cocoa. We are hoping for good harvest this year. We have been working with a new project Quintas Lomas La Perla which is selling lots and lots with houses between Finca Rio Perla and the center of the village. The lots are individually titled with utilities (water, electricity, telephone) and easy road access. All the lots (1/3 to 1/2 acre) border perennial streams and are in easy walking distance to the primary school and its large futbol field and the crystal clear water of the Perla River and "Playa La Perla".